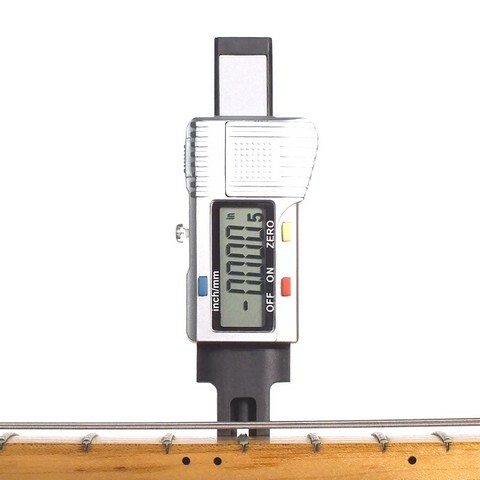 This is the original digital string height gauge. With this device you can measure the ACTION of the strings and the neck RELIEF with no need of anything else. Very useful to check the set up or save it before taking any action on your instrument. With this tool you can also compare your set-up before and after a fret level. The Digital Action Gauge will also help measuring accurately the HEIGHT of your frets and many many other things... (0.01mm resolution and INCH conversion). *This is how to find the amount of neck relief by three points action measuring and a simple formula. By R.M. Worldwide shipping $5. NO REGISTERED NUMBER. No insurance. It usually takes 7~14 days to arrive except for countries with slow customs and post service. For shipping service with REGISTERED NUMBER *additional $5, please choose "Shipping options: DAG + Reg Number". Thank you!